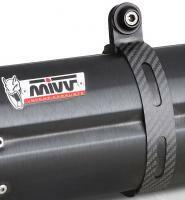 The new MiVV Suono is developed from the experience gained in winning the World Moto GP Championship with Honda. Made entirely from AISI-304 Stainless steel with Carbon fibre end cap it is light-weight, just 1.9kg, superbly styled and measures just 435x125x95mm. Fully road legal, EU Homologated with removable db killer. Also available as CARBON SUONO with Carbon sleeve and end cap and TITANIUM SUONO ultra light with Titanium sleeve and internals plus Carbon cap weighing just 1.2kg.